I have been wanting to write a piece on Thierry for a while and just wanted to remember the great man and the piece Sky Sports did made me do it! Firstly, a great piece by Sky Sports on our hero, Thierry Henry. It brought memories flashing through my mind. The ‘legend’ DVD always gets me quite emotional and this sky sports piece once again reminded me of how great Thierry Henry was. 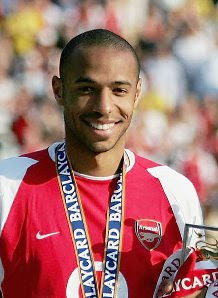 Apart from the obvious, what I love about Thierry Henry is that he ‘understands’ what it means to play for Arsenal. He says himself that the likes of Tony Adams, Lee Dixon, Nigel Winterburn and Ray Parlour (along with others like Seaman and Keown etc) made him understand what it means to play for Arsenal. Tony Adams in particular is said to have given him a speech when he first arrived explaining how important Arsenal is and what it means to play for us. When the fixture list comes out, the first thing he looks at is when Arsenal are playing Spurs and that shows how much he understands what it means to play for Arsenal and understands the supporters. At the moment, in this current squad, I am not sure if any new players that come will be made to understand what it means to play for Arsenal like Thierry was. Jack Wilshere off course has been here for a very long time and will understand that ‘feeling’ and there are others like Robin that may understand but will they make others understand it? I’m not convinced (Jack over time may well do though). Back to Thierry though, he mentioned two things that I smiled about. When he talked about big clubs he mentioned Arsenal, Man Utd, Chelsea and Liverpool and mentioned those teams a few times but had no mention of Spurs! Also when asked about who he best player was that he played with, he without any hesitation answered ‘Dennis Bergkamp’. You may ask why the surprise, but he did play with Zidane who was an amazing player too. I was more surprised that he didn’t have to think about it. That shows how good Dennis was. Technically, Dennis Bergkamp was the best player I have ever seen. Many people were quite shocked to hear Thierry mention Ledley King as one of the best players he played against. He said that Ledley was a tough opponent because of the way he defended etc. He also talked about Paul Scholes, which he has on a number of occasions, he talks about his goals and his ability to pick a pass. He also said his a big fan of Steven Gerrard. He talked a bit about Wayne Rooney and in particular his high work rate and compared it to the likes of Ray Parlour and Martin Keown etc. A superb quote from the piece was ‘finishing the season unbeaten was quite special and to do it with my beloved Arsenal was amazing’. The way Thierry talks about Arsenal is special because he talks with so much respect. He loves the club and the club and supporters love him. He says he can never be objective about Arsenal and we all know he is still a big supporter of the club because he tries to come as often as he can to watch the team play. Thierry Henry was simply a legend and his 226 goals for the club will never be forgotten. His goals, his assists, his leadership, his pace, his mental strength and his love for Arsenal all stand out and the piece run by Sky Sports just reminded me how good he was.